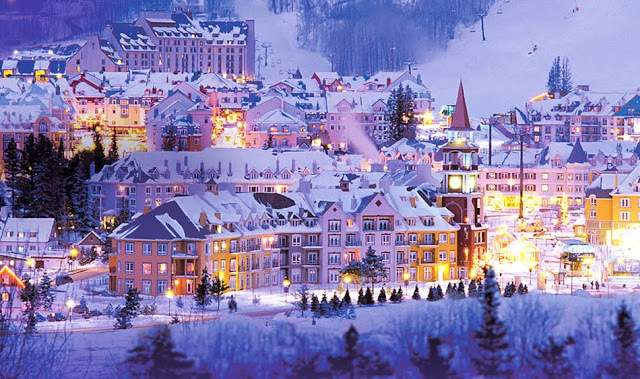 Mont Tremblant, Quebec, Canada. Photo courtesy of Tourisme Mont-Tremblant. Magical Holiday Lights and Decorations. One of several attractions at the City Lights Festival. 2. 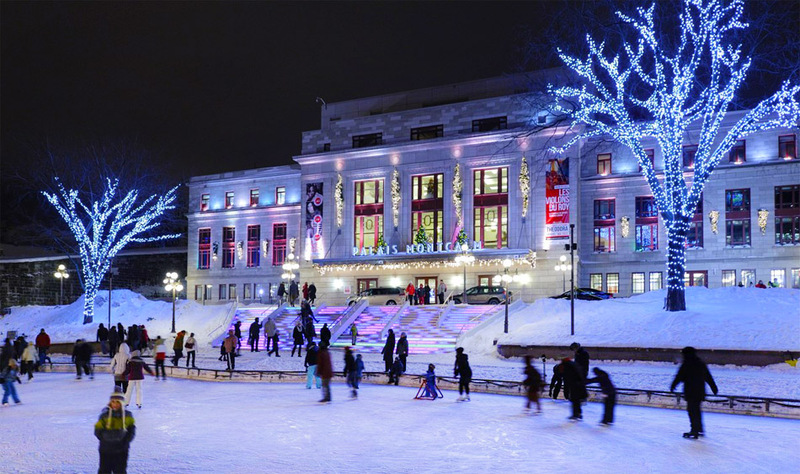 With the Québec City Lights Festival, the city’s historical and architectural treasures are illuminated in celebration of winter and the holiday season. Beginning on the winter solstice this celebration of the season allows the town’s important locations to glow brightly. Ice Palace at the Québec Winter Carnival. 3. 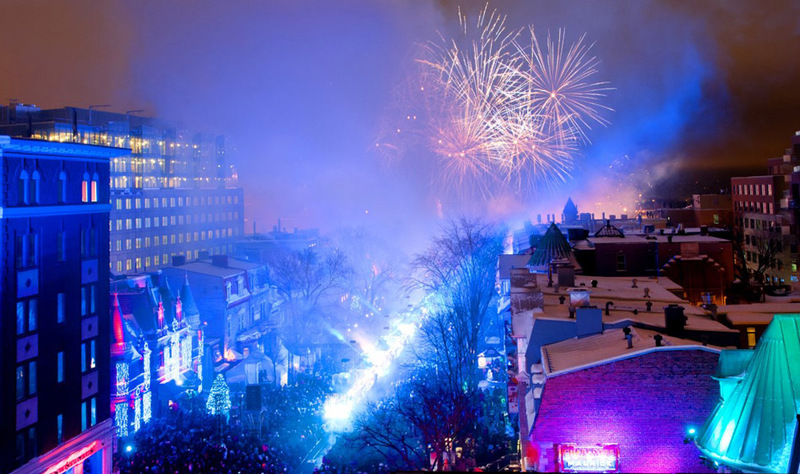 Quebec Winter Carnival features an Ice Palace, snow sculpting competition, dogsled races, sleigh races, night parades, ice skating rinks, ice canoe racing and more. 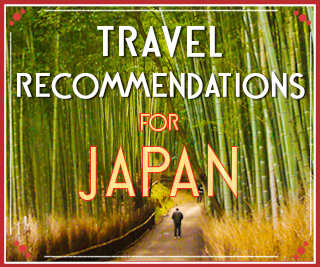 This tradition began in 1894 and gets better each year – Jan 30th through February 15th. Nordic Station Spa of Magog, Quebec. 4. Nordic Spas. Enjoy thermotherapy at any of the near-dozen world class spas with hot and cold treatments such as steam baths in the outdoor snow, thermal waterfalls, steamy spas, cool pools, and saunas. This is definitely my top reason to visit. 5. Hotel de Glace (Ice Hotel) is beautiful. 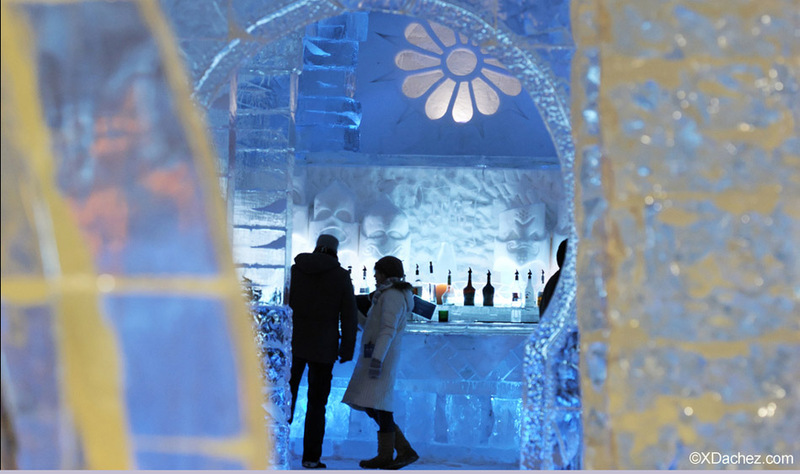 Go there to enjoy a cocktail in -5° C or spend a cozy night in a room made of ice. Some suites even have their own spa and fireplace! 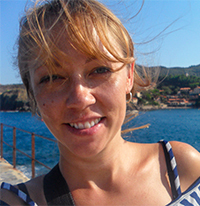 You also have the option to spend a memorable night in an igloo, yurt or heated shaputuan. Hotel de Glace is open from the first week of January to the last week of March each year. New Year’s Celebration on the Grand Allée. 6. New Year’s Celebration on the Grand Allée is something special. 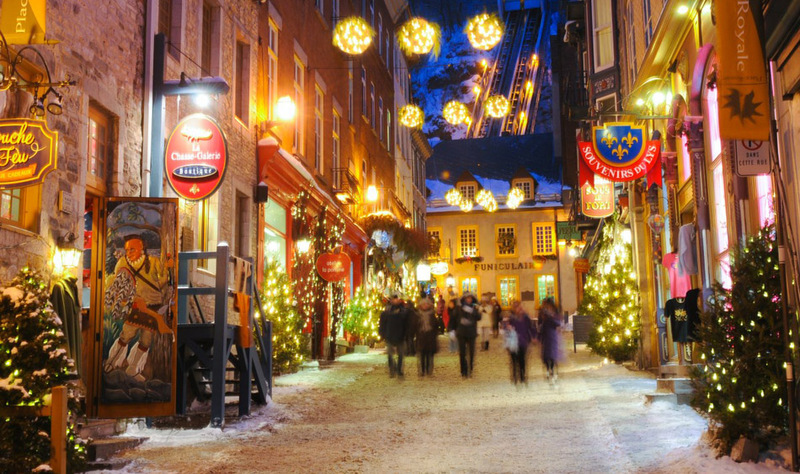 The Grand Allée is one of the most famous streets in Québec, renowned for it’s restaurants and beautiful buildings. It’s the Champs Élysée of Québec. Every restaurant and bar along this street is dedicated to making sure that your New Year’s celebration is comfortable and fun, with heated patios, singers, musicians, DJs, and an epic firework show at midnight. 7. Christmas Market on the Old Port has over 1000 regional items and handicrafts in a magical and festive atmosphere. November 21 to December 31st. 190 Gorgeous Ski Runs in Québec City. 8. Downhill Skiing and Snowboarding. 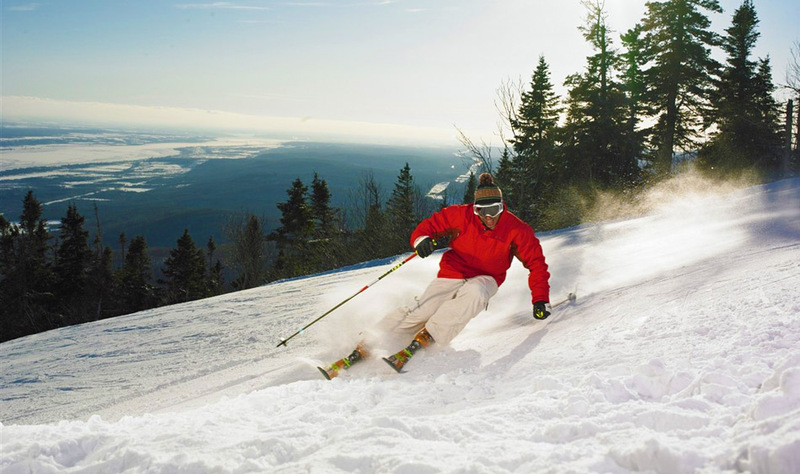 With optimum snow conditions and fantastic terrain, Québec has four ski resorts each with shuttle service, equipment rentals, a ski school, ski shops, restaurants and babysitting service. They take pride in offering an epic ski experience for skiers of all levels, both day and night, on a total of 190 different runs! 9. Cross Country Skiing and Snow Shoeing. The Québec City region has over 2,000 kilometers of cross country ski trails which you can enjoy with the sweet aroma of evergreens. Tubing at North America’s Biggest Winter Park. 10. 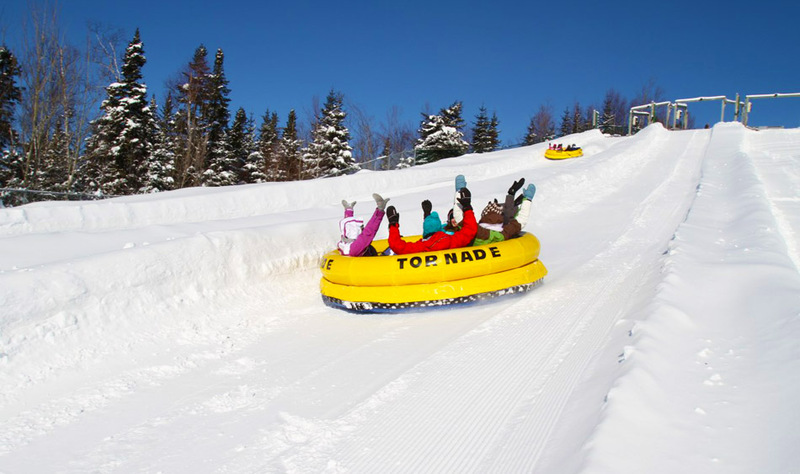 Tube your way down the snowy slopes at Valcartier, North America’s biggest winter playground. This place has sledding and tubing more adventurous than you’ve ever seen. BONUS: 30 Québec Hotels are offering 3rd Night Free to help encourage visitors to stay and explore the region. 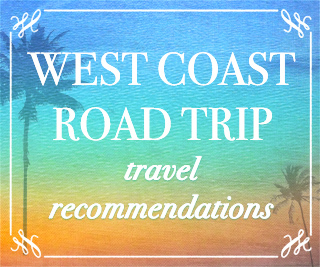 Find a complete list of participating hotels here. Just because Christmas has passed, doesn’t mean that the winter holiday has! Additionally, Expedia is offering last minute flight and hotel deals to Québec, you can find that deal here. 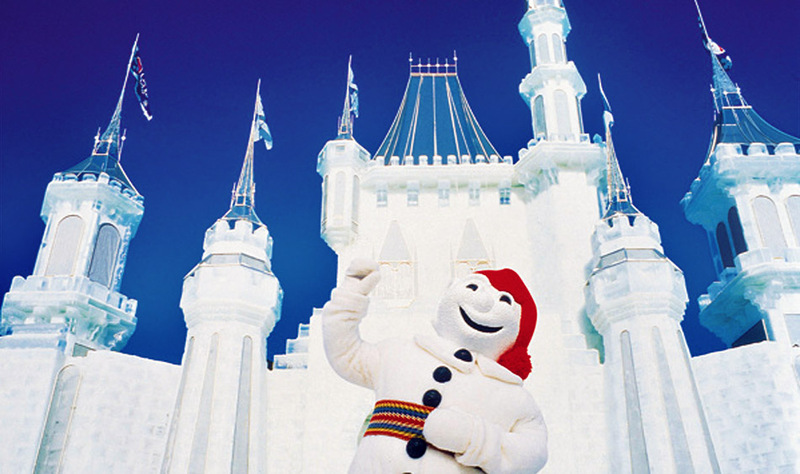 The Québec Office of Tourism has one of the best tourism websites in existence. 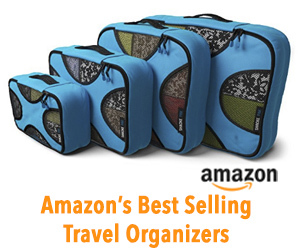 Here you’ll find their holiday attractions page. 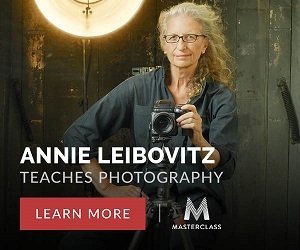 Much thanks to them for permission to use their photos.